After a successful series of Spring events, we will be taking a break over summer. Drawn at the Tower with Art Macabre will return this Autumn 2016. Dates for your diary are here. Tickets and full information on event themes on sale here. Tickets are between £20 to £24 (concessions see website)- block booking discounts also available. All drawing materials, paper and a drink included in the ticket price. Explore the myths and legends surrounding some of the world’s most fabulous jewels in this glittering after-hours event at the Tower of London; such as the brazen attempted theft by Colonel Blood. Sketch contemporary fantastical crowns by designer maker Hysteria Machine and capture Kika von Macabre in all her glory in the Medieval Palace at the Tower of London. Draw a skull-faced catacomb saint bedecked in glistening gold and pearls. You will be dazzled! Discover the martyrdoms of four religious rebels in the chapel of St Peter ad Vincula. Remember Guy Fawkes, and hear the tales of Sir Thomas More, Anne Askew and Margaret Pole, all who lost their lives in the pursuit of the freedom to express their religious beliefs. With guest artist Lozzy Bones capture their bold portraits in the chapel’s crypt. Explore chiaroscuro techniques with guest artist Frank Gambino. Capture shadows and sketch England’s finest example of Norman architecture inside the Romanesque chapel of St John the Evangelist in the White Tower. Illuminated figures from the Tower’s past will pose within its walls. This event is sure to be a magical and atmospheric drawing experience, with live music from Carmen Mon Oxide. Drawn at Tower is a creative collaboration between Historic Royal Palaces and Art Macabre, inviting participants to use drawing to explore stories from the Tower of London’s remarkable 1,000 year history. From martyrs and macabre tales of religious rebels to glittering intrigue of jewels and crowns, each event will illuminate the Tower’s dark past. Drawn at the Tower is directed and designed by Art Macabre, and delivered by a team of guest artists including Sue Dray, Frank Gambino and Lozzy Bones, to create an immersive experience. Be among the first to experience this unique after-hours drawing series at the Tower of London that will run regularly from spring 2016. Art Macabre inject a lethal dose of theatricality and curiosity into drawing. 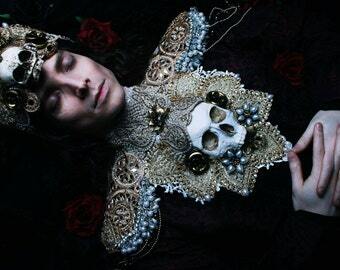 Directed by Nikki Shaill, Art Macabre specialise in creating immersive drawing events in unique spaces that bring together elements of narrative, performance, music and theatrical themes. Since 2010, thousands of participants have enjoyed drawing from both the imagination and observation.